Jeremy, aka Disappearing One, checks in with a review of the Origins Connor figure from Sideshow. I thought it looked good when I opened the flap on mine, but he makes it look even better! Tell us all about it, Disappearing One! 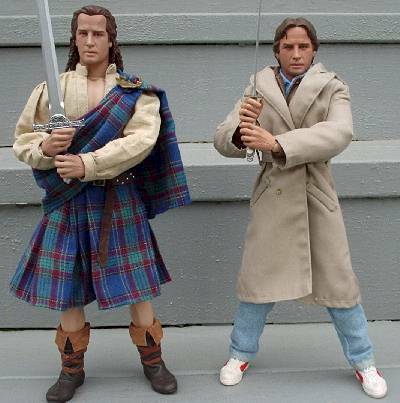 Highlander has long been my dream toyline that didn't seem likely to ever happen. Sure, Highlander does have a fan base, but it always seemed just a bit too obscure for company to actually take the plunge a grab the license. There was that line based on the terrible Highlander animated series from the mid-nineties, but those were only released in Europe or something. Heck, even if they had been released in the United States they still wouldn't have likely satisfied fans. 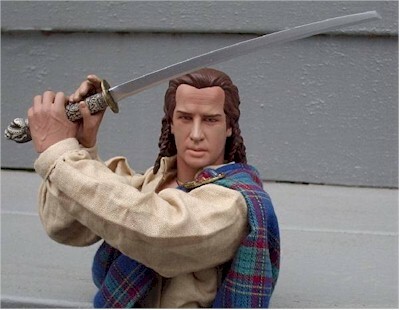 So you can probably imagine my surprise and excitement when Sideshow announced they were producing Highlander figures. Pricey twelve inch figures weren't exactly my ideal scenario, but it really didn't matter. 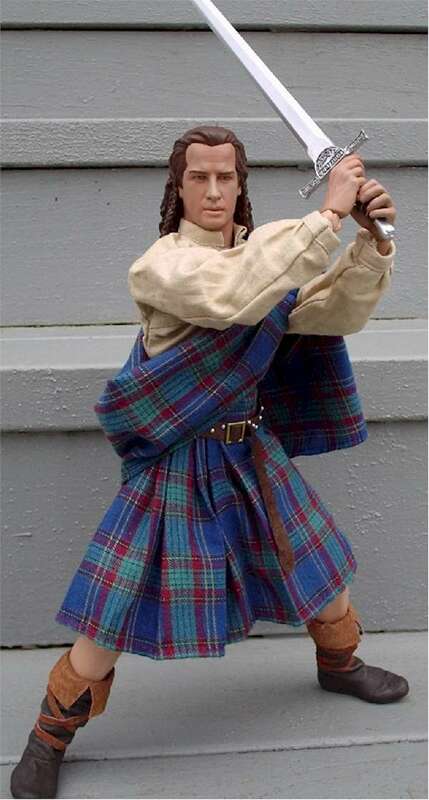 I was finally going to get my hands on some Highlander toys. A very brief synopsis of the Highlander story in case you're unfamiliar: The movie follows the story of Connor MacLeod (played by Christopher Lambert), a young man born in Scottish Highlands in the 1500's who is killed in battle. He comes back to life and is driven from his village out of fear that some sort of black magic is involved. He later learns from his new mentor, Juan Sanchez Villa-Lobos Ramirez (played by Sean Connery), that he is immortal, and that he is not alone. There are other immortals, and they can only be killed when beheaded. They must fight until only one remains. There was also the television series which followed the adventures of Duncan MacLeod. 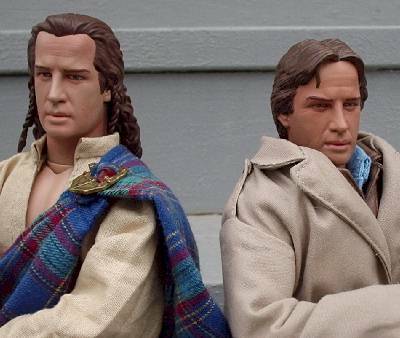 So far Sideshow has released four figures; Modern versions of Connor and Duncan MacLeod, and Origins versions of Connor and Duncan. Origins, meaning in their traditional Scottish garb. They also have a modern Kurgan on the way, who was the bad guy from the original movie. They haven't announced anything more past Kurgan. I'm hoping for, but not counting on, them announcing any more. 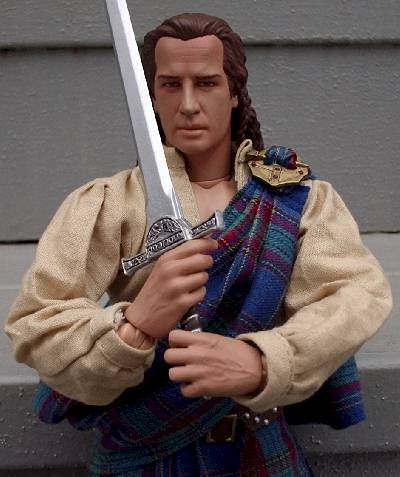 The Sideshow Exclusive version of Origins Connor MacLeod is what I'll be covering in this review. Sideshow has a reputation for producing some truly terrific looking box art. so why that didn't carry on into their Highlander figures has me a bit baffled. 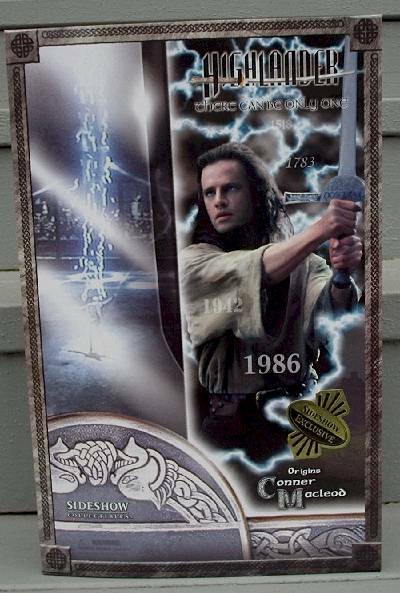 They've used a picture of Christopher Lambert as Connor MacLeod opposed to a picture of the figure which I like, but other than that it looks too much like a bunch of random elements quickly Photoshopped together. Too much randomness combined with a lot of dark colors just isn't particularly appealing to my eye. But it doesn't end there. Back when the Modern Connor came out, the first thing I noticed was that they misspelled Connor as "Conner" on the box. I figured it was just something that slipped through and wasn't noticed until things were too far along to change. But they've done it again here, so I guess someone has been asleep. Interestingly, they've spelled it correctly on their website all along, so who knows what's going on. Yeah, I know it's pretty nerdy complaint. I think an image from one of the movie posters on the box would've been killer. However, I've never bought a toy for the box. My thoughts on the packaging will have no real impact on the final overall score. I was always pretty pleased with the modern Connor sculpt, but there was always something about it that was ever so slightly off that I just couldn't quite put my finger on, and it wasn't until I received Origins Connor that I realized what it was. In my opinion, the face on modern Connor is just a bit too round. He also doesn't have much of a neck. Lambert may not be a giraffe neck, but he does have a neck. Those issues have been dealt with on Origins Connor. Lambert may have the most distinctive forehead and brow line in the history of the universe and it's all been captured quite well. Combined with the lack of too much facial roundness and you have one pretty spot-on likeness. My only real issue with the head sculpt is the hair. It certainly obvious that it's supposed to be hair, but it's just a little to soft and under detailed. It almost looks a bit like melted chocolate. It's not a huge deal, but noticeable enough for me to justify taking off that half star from the score. What little paint there is on the figure itself are on the head, and it's all very neat and clean. The hair is entirely painted with one shade of brown, and it would've been nice to see them do a little more with it. A subtle wash of lighter or darker brown may have helped cover up some the issues I mentioned regarding the hair sculpt. Sideshow's standard body has a terrific amount of articulation, so it's no surprise that Connor here is mondo articulated. The hair doesn't block the ever so important ball jointed neck making it easy to pose him with whatever "attitude" you desire. The boots, however, hinder the movement at the ankles a bit making it a little tricky getting him to stand on his own in some action-oriented poses, thus the loss of half a star. Otherwise, the joints are not too loose or too tight making posing him a synch. 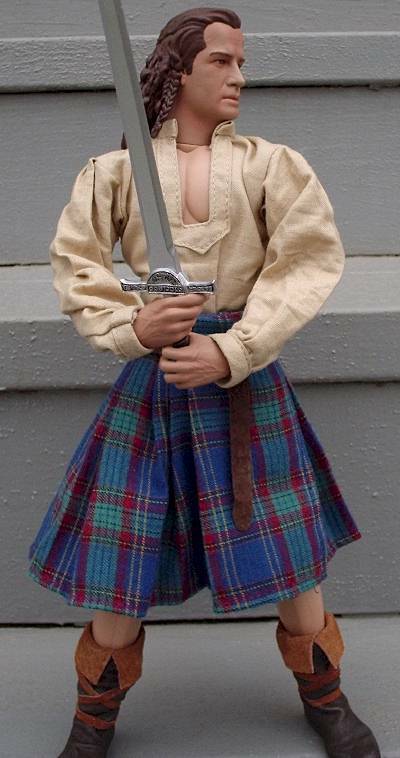 The costume is made up of five elements: shirt, "sash", kilt, belt, and boots. Yes, like any good Scotsman, he is going commando. The shirt is appropriately simple. It works, and frankly I don't really have much more to say about it. The sash (yes, I know it's not really a sash, but I don't really know what else to call it. I guess I should research kilts a bit more) has a snap underneath the brooch for easy removal. 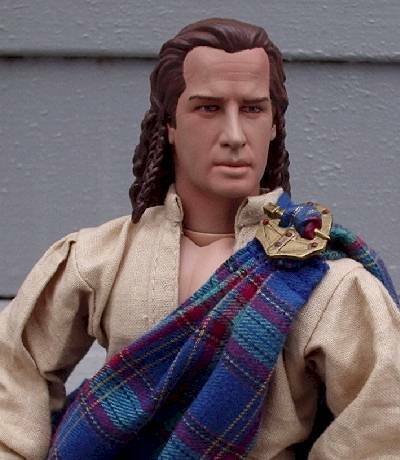 If you look closely at the part where the fabric from the kilt comes through the brooch it's actually painted on. It took me a while to notice that. 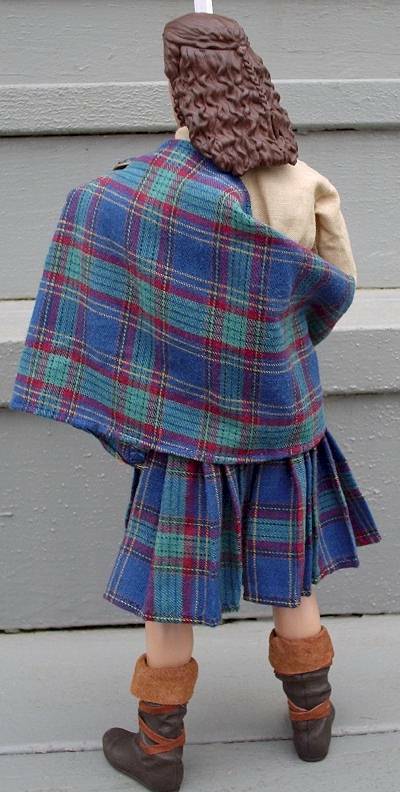 The kilt is something I was always a bit concerned about. I feared that it may look a little goofy at this scale. Maybe even look a bit like a schoolgirl's skirt or something. Thankfully, they've pulled it off quite nicely. It has just the right hang to it. There is a snap on the side, although I've never taken it off. The belt is made of very thin faux leather. The buckle can be adjusted, but I'm afraid to mess with it too much since if feels like it may be a bit flimsy. One of the little studs on mine is missing. The boots are made of sculpted rubber and faux leather cuffs and straps. They also aren't very much like the ones Connor wore in the movie, which appeared to be made out of animal pelts. They do a least look plausible as something someone in the Scottish Highlands in the 1500's might have worn, so I guess that 's something. As I mentioned previously, they do interfere with ankle movement a bit. So that, combined with inaccuracy, lost the outfit a star. 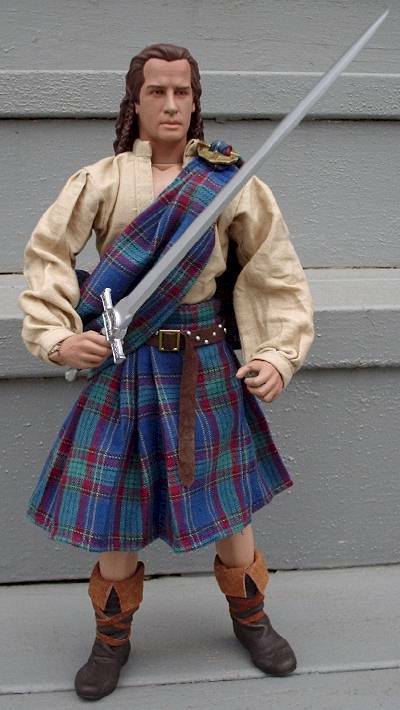 The exclusive version of the figure comes with four accessories: The MacLeod claymore, the Ramirez katana, a Highlander logo stand, and a leather jerkin. I have some issues with what is probably the most important accessory, the MacLeod claymore. It seems to be based off of a replica of the sword that is currently available on the market rather than the sword that was actually seen in the movie. It's very similar to the movie sword, but there are noticeable differences. The shape of the blade is different, the handle is different, and most obvious, the hand guard is too small. 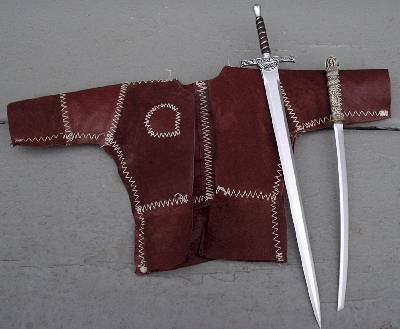 The guard of the movie sword is much bigger and it gives the sword a much meaner and more lethal look. Take a look at the picture on the box and you'll see what I mean. Still, I can't hate the sword all that much. It is very much like the sword from the movie, and it does actually look nice. The "MacLeod" inscribed on the guard is very nicely done and easy to read. The katana Connor stole. er, inherited from Ramirez is the exact same katana that came with Modern Connor. The handle is nicely detailed and is close enough to what was seen in the movie to keep me happy. If you liked it before you'll like it now. The stand is a simple doll-type stand that comes with most (all?) Sideshow sixth scale figures. It's not the most attractive thing, but it certainly will keep your figure from randomly falling over as seems to happen to me a lot. That leaves us with the accessory that makes this the exclusive version, the leather jerkin. It's one of those things that maybe seemed like a better idea when it was on the drawing board than it did in reality. I suspect making it out of real leather may have limited them a bit, and I think that pleather may have been a better way to go. It has huge seams running down the sleeves and sides making it look like it could be inside-out. That is how it appears in the photos on Sideshow's site so I'm assuming it's supposed to be that way. It does have an appropriately rough-hewn appearance to it, and it does look better on the figure than it does off. However, it interferes with the figure's shoulder articulation, making so you can only get his arms to go so high. While it is nice to be able to change his look from time to time, ultimately it's one of those extras that's kind of cool if you have it, but if you're not able to get the exclusive version you're not missing out on anything huge. I've been wanting Highlander toys for years now, so I've been having a blast seeing it finally happen. Playing around with these toys has been a geek fantasy that had gone unfulfilled for entirely too long. 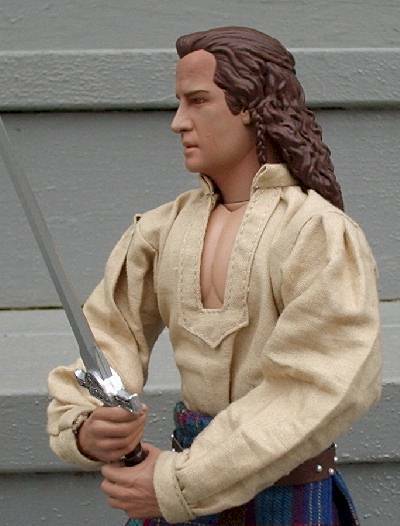 Would a kid who probably has no idea who Connor MacLeod is have fun with this toy? No, probably not, but kids are definitely not the intended audience. Connor costs $45, and that's a lot to spend on a domestically released toy, even if it's a really nice one. I realize Sideshow does smaller production runs aimed at the collector market and all, but it'd sure be nice if they could get some of these prices down at least a little bit. Those swords aren't going to take a lot of abuse. I recommend using the figure stands to help make sure those swords don't get damaged or broken by a fall. My modern Duncan MacLeod learned this the hard way, and his katana is now "battle damaged" along the edge of the blade. Despite a few fairly minor issues , I still think this is a fantastic figure. 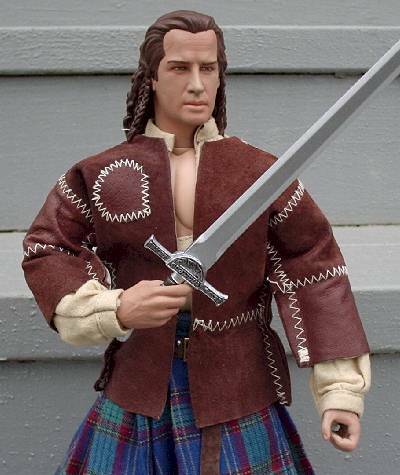 If the thought of Highlander toys doesn't make your geek parts all tingly you can probably go ahead and take a whole star off the overall score. If you're a Highlander fan it's a no-brainer. You'll be thrilled with this figure. If your heart's set on getting the exclusive version of this figure, I'm afraid you may be out of luck. The exclusive version of Origins Connor is the first of Sideshow's Highlander figures to sell out, so it looks like you may be heading for Ebay. You can still order the regular Origins Connor, as well as the exclusive Origins Duncan and exclusive versions of the modern Connor and Duncan at Sideshow's website. They're also taking pre-orders for the Kurgan. - Sideshow still has the Origins version available for $40. - Dark Shadow Collectibles has him up on pre-order for just $35. - Alter Ego Comics has him in stock for $38. MWC reviewed the modern Connor awhile back. Figure from the collection of Disappearing One.